Who said fruits and vegetables can’t be show-offs in the ornamental beds? Mix fruits and veggies into your flower and shrub borders to add drama, texture, color and, most importantly, food! Displaying white flowers tinged in pink in little tassels during late spring, blueberries will grow only in moist, peaty soil with a pH lower than 5.5. The best way to grow them is in an informal border or along a woodland setting with other acid-loving plants like rhododendrons. To ensure good pollination, two different cultivars should be planted together. Plants should be protected from birds with netting when the fruit begins to ripen. Apply cottonseed meal to the soil in spring, water regularly during dry summers and prune the plants in winter by cutting out dead or damaged branches. You can also lightly trim plants in spring to keep them compact. 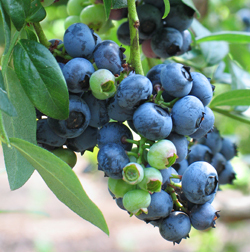 Blueberries are rarely attacked by insects or diseases, but will look pale and chlorotic if the soil is not acid enough. Although not particularly ornamental, bramble berry bushes, when trained on wires, offer a nice summer screen, or they can be grown against a fence or wall. Both raspberries and blackberries require slightly acidic soil, adequate moisture and will need support. Plants will succeed in light shade, but prefer a sunny location. Mulch in early spring with manure or compost, then cut old canes down to the ground after fruiting in early to mid-summer. No more than 5-6 strong stems should grow from each plant. Protect fruit from birds and squirrels to ensure enough left to harvest. In the past few years strawberry plants have become increasingly popular for their ornamental qualities. Beautiful white flowers with yellow centers become delicious, glowing red strawberries. When choosing cultivars, be sure to try both June-bearing and ever-bearing selections to extend your harvest. Alpine varieties are perfect for edging a path. 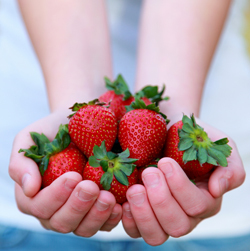 Strawberries require deep, well-drained, nutrient-rich soil for the best results. 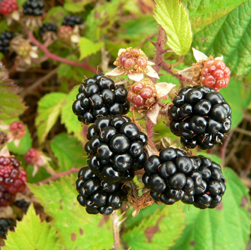 Plant in early spring and replace plants every three years for the best-tasting berries and most productivity. Fertilize in spring and cut off runners as they form to keep plants fruiting well, unless you are starting new transplants. Spread salt hay around plants as fruit starts to develop to keep the berries free from soil and well ventilated. Protect from birds and watch for slugs and botrytis (moldy, grey fungus) during wet springs. Trained over an arbor or combined with clematis on a pergola, grapes add an elegant touch to any landscape. Plant grapes in well-drained, fertile soil where there is full sun. When growing on a trellis, limit your grapevine to a single stem or trunk. Train the leading shoot vertically and the lateral shoots horizontally. 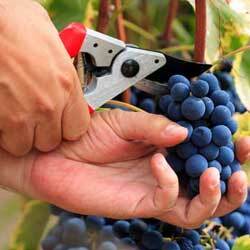 There are also various other ways to train and prune grapes, but do not let this task scare you. Grapevines are very forgiving. Birds will love the rich, aromatic fruit so you may want to protect several areas to ensure a good harvest. Offering beautifully colored stalks of pink, white or red, rhubarb can be grown in any kind of soil in a sunny spot. You can pick from this trouble-free plant from spring until early summer. Only the stems of rhubarb are edible; the leaves should be discarded. Add plenty of manure to the soil, keep damp during dry summers and remove tall stems before they produce flowers. Although decorative, larger stems tend to reduce plant vigor. Divide every five years or as needed to control plant size. Watch for tunneling insects on the leaves and treat with rotenone as needed. Adding an air of distinction where space is limited, a fig tree can be grown in a large pot. Forgiving figs do well in poor soil, but need a sunny, protected area, which may mean a south-facing wall. These ancient trees tend to produce more fruit when their root systems are restricted. Therefore, when planting in the ground, it is a good idea to dig a hole about 3 feet wide and line with bricks. Mix plenty of bone meal in with the soil, too. Mulch fig trees in late spring with compost and water in dry weather while the fruit is growing. You can also encourage these trees to produce more fruit by pinching new shoots in spring. With careful planning, it’s easy to mix beautiful edibles in with your landscaping beds, allowing you to do double duty with your gardening and landscaping combined and dramatically increase what you can harvest and enjoy.